Renaissance Esmeralda Resort & Spa has graciously offered all attendees of this retreat the opportunity to stay at the venue up to three days before and/or three days after at a rate of US$159.00 per night (plus taxes). Resort fees, maid gratuities, and food taxes during these additional days are the sole responsibility of the attendees. The regular standard rate for the rooms you are staying in is US$239.00 (plus taxes) per night. A discount of 10% is also being offered for spa services each day of the retreat (and 3 days before and after the retreat) except December 31. Please read the appropriate section below for details. PLEASE NOTE: Any bookings for the retreat made after the 19 December, 2013 cannot be guaranteed the original advertised rate. *Room sharing requests may be made in the welcome packet. We will endeavor to honor, but cannot guarantee, all such requests. Registration fee includes: 6 days, 5 nights, double occupancy stay at Renaissance Esmeralda Resort & Spa; all vegan meals throughout the Retreat; all fees, gratuities and taxes; a celebratory dinner on New Year’s Eve; as well as all discourses and ceremonies with Louix Dor Dempriey. The pricing above does NOT include: items of a personal nature, sundry expenses incurred during your stay at the venue, travel and travel-related expenses to and from the Retreat. 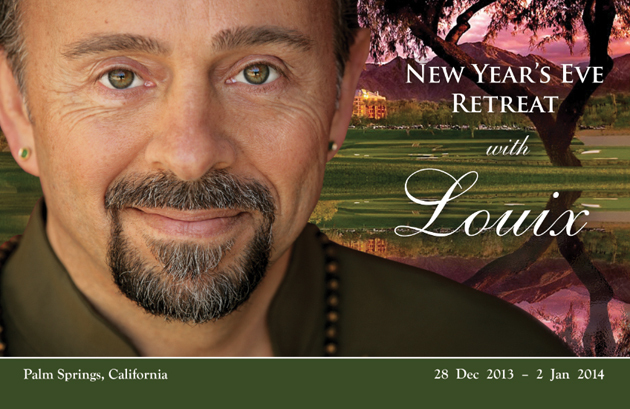 Please register me for the Residential Retreat with Louix Dor Dempriey from 28 December 2013 - 2 January 2014. All monies are due in accordance with the schedule above and all payments other than the non-refundable deposit are refundable until 15 November 2013, after which there will be no refunds of any kind, for any reason whatsoever. Please note that refunds may take up to 45 days to be issued. By submitting this form, I do hereby release Louix Dor Dempriey Foundation and its agents and assigns from all liability for any reason and/or circumstances whatsoever arising before, during, and/or after the Retreat, including during participant’s travel to and from Retreat, as outlined in any advertising materials and on any and all forms related to this Retreat. I also acknowledge that I understand the terms and conditions under which I am registering for this Retreat, that this form is legally binding, and that I am eighteen years of age or older*. My attendance at this Retreat is not guaranteed until this completed Registration Form, the Recording Release, Liability Waiver, Medical Information Form, and full payment are received by the Louix Dor Dempriey Foundation. I do hereby consent to having my name, voice, image, and likeness recorded and used for commercial purposes. * Please complete below if participant is under the age of eighteen: I am the Parent or Guardian of the minor named above and have the legal authority to execute this release on behalf of the abovementioned minor. Hello. 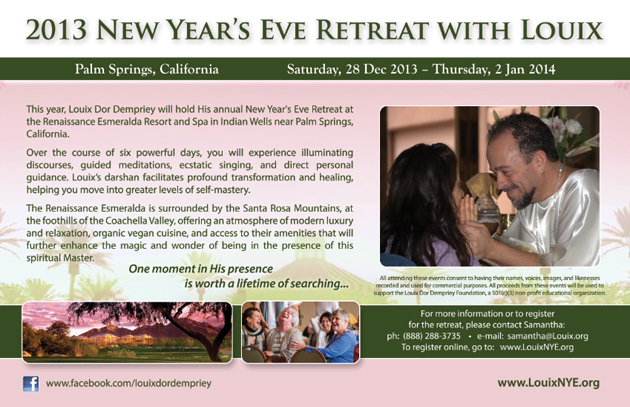 I am interested in attending the New Year’s Eve Retreat. I spoke with Saryon Michael White and he mentioned there could be some assistance with scholarships. Would you please let me know what are the guidelines for this and if I could participate. I know that I am to meet with PRANANANDA. Thank you for your assistance.